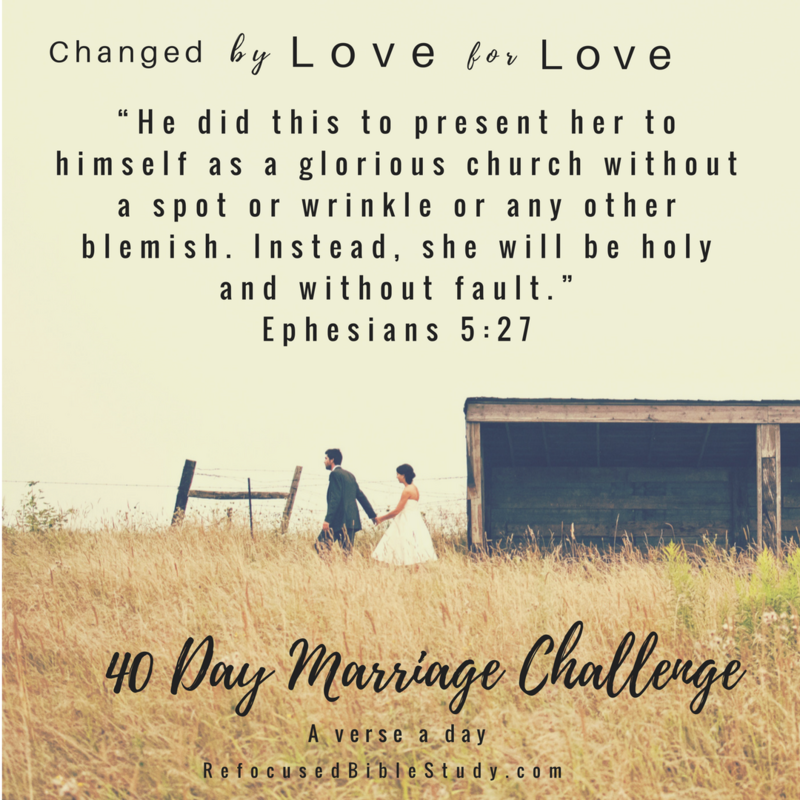 It’s day 33 of the 40 Day Marriage Challenge here at Refocused. Today’s challenge is: Recognize ways your husband is giving himself up for you, and thank him for it. O -Observations: Jesus gave up his life for the church. Gave up his life. Sometimes I think we skim over the depth of love Jesus has for his church; for us. He loved her to death. He held nothing back. He gave it all. This love is a model for marriage. V -Verse’s implications for marriage: Husbands are to live their wives in this way- to use words that evoke her beauty, and bring out the best in her. Ask God to help you see ways your husband is, in fact giving himself up for you. It is so easy to get caught up in recognizing flaws and disappointments. Are you missing the beautiful ways your husband is sacrificing himself for you? It could be small things like going to watch a chick flick with you – or could be like a larger sacrifice like going to your family’s holiday get together instead if his. Thank him when you see him lay down his desires for your sake. E- End in Prayer: Lord Jesus, thank you for dying for your bride, the church. You gave it all. You show us how to love each other in marriage. Please help us show our husbands respect by recognizing how they are giving themselves up for us, and thanking them. Help us never nag them into sacrificing for us. Help our husbands to love us more like you loved the church, and help as radiate your love back onto them. In Jesus name, amen. I love that verse; this is a beautiful post! What a great reminder to look for something specific our husbands are doing to sacrifice for us. It’s helpful to be more aware of the good things they are doing for us rather than what we don’t see done for us. Thanks for sharing! It’s easy to take each other for granted. Enjoy showing your man some gratitude! So good, isn’t it? Jesus is amazing! I love this challenge! Such a great thing to help us remember marriage is so important. And I love today’s challenge because I know I’m guilty of forgetting to thank my husband for all the things he does for me. He truly does love me like Christ loves the church and I couldn’t be more thankful! Observing and appreciating our spouse are things we can so easily forget when life gets busy. But it’s in those times when it’s even more important. Thank you for the wondeful reminder to keep my eyes open in my marriage.